Editorials from Theslowlane: Book and mortar instead of brick and mortar. Are large library buildings still needed? Book and mortar instead of brick and mortar. Are large library buildings still needed? 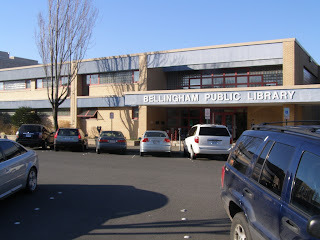 Bellingham is outgrowing it's popular library. 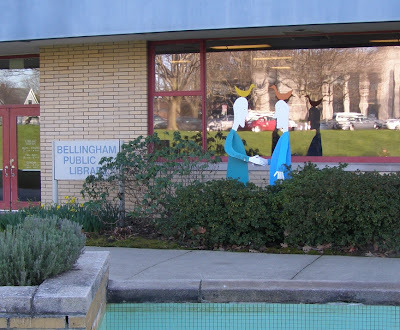 Scott Ayer's column in Bellingham Herald has had some interesting thoughts about the proposal for a new city library. There's the question, do we really need a new library since many functions of the library can be done on the Internet? Research, for instance. Quite a few books are now on-line. Libraries provide spaces for community gatherings with conference rooms, but there are chat rooms and other forms of interaction on the Internet. One cost estimate for the new library would be around 54 million. City of Bellingham has put the idea on hold for a while. I say, thank God there is the Internet. The gathering of community in real space can get expensive as well as problematic. Still, like so many people, I do prefer face to face interaction. People also like real things, like books made out of paper that one can hold. On the other hand, there are problems in society that prevent face to face community as well as access to a wide variety of real items such as books. Paper books take lots of space and real estate is expensive. The city does own the land under our proposed library, but 54 million for a new facility is a chunk of change. "Real" can be expensive especially when real estate is expensive. I'm sure they wonder if a new library bond would pass with all those other straws on the taxpayer's back. Also there's the higher cost of maintaining a larger facility. Something that would still have to be calculated into our city's ongoing budget. Folks often blame the Internet for generations of Americans who don't interact much in person. Well, I think this problem is more related to economics. Can taxpayers afford such things as libraries and community centers? There are many forces in society that keep people isolated from one another. Isolated and insular; especially in the sprawling suburbs. Many neighborhoods don't even have sidewalks. The amount of time folks spend alone in automobiles just getting to work is phenomenal. Speaking of work, the lack of time for friends and conversation is a problem. Everyone seems so busy. Folks are often are kept busy with trivial pursuits, such as ringing up orders for soda pop at a cash register. In our fast pace world, thank God there is the Internet. At least there's some interaction on the net and it is great to have such a wide variety of reading material at one's fingertips. More than a single library could afford. Don't blame the Internet for the dumbing down of America, or people's lack of face to face community. There are a lot of trends in society that create this environment. Things like economic forces and even lack of sidewalks. The automobile is a big culprit. Interesting to note that part of the cost of a new library is the parking garage. Estimated cost of 4.8 million for roughly 123 parking spaces. That's $39,000 per parking spot. Maybe folks should be asked to meet their neighbors face to face on the bus. I'm generally in favor of things like building a new library, but people sometimes call me a "tax and spend liberal."